Mental health is pivotal for success in every domain in life. Yet mental health issues continue to get shunned and carry burdensome, exacerbating stigmas. But the truth is that we ALL deal with mental health issues and varying degrees of ups and downs. Unfortunately, it takes high-profile suicides, tragic school shootings, and TV shows for many to be sensitized to the gravity, devastation, and reality. In this episode of BioTrust Radio, we want to reach out to anyone who’s in a dark place — whether that’s you or someone you know — give 13 reasons why NOT, and remind you that life is precious. With high-profile suicides, tragic school shootings, and the popularity of the TV show 13 Reasons Why (which centers around a high school student who ends her own life), we cover a topic that has been heavy on our hearts: mental health issues and suicide. Despite their prevalence, mental health issues tend to be very personal and private, taking a backseat far too often, which only magnifies their weight. 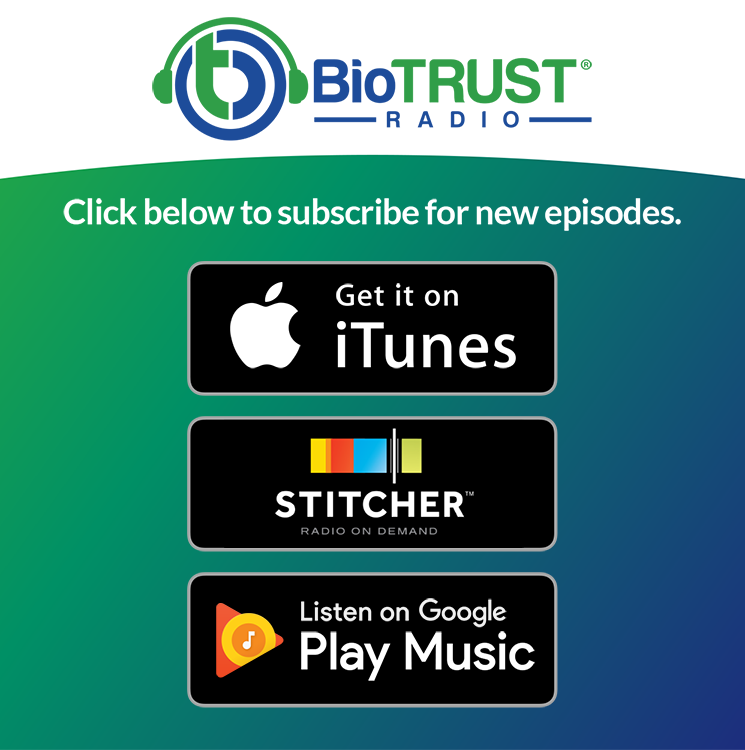 In this episode of BioTrust Radio, we share our own personal experiences, including thoughts of ending our own lives. Unfortunately, many successful people who are in public view often portray themselves as being perfect — creating misleading images that are exacerbated by the prevalence of social media (and myriad perfect pictures). That is simply not true. We all deal with varying degrees of mental health issues and ups and downs — EVERYONE. And our goal is to reach out to anyone and everyone who will listen, remind you that life is precious, and give you at least 13 reasons why NOT (to take your life, how to get out of a rut, etc.). If you’re in a dark place, we want to help you seek the light. If you know someone who’s in a dark place, we want to encourage you to shine your beacon of light on that person. If you know someone who might benefit from this, please SHARE. YOU can be one of those 13 reasons why not to that person. And please share your feedback below. We look forward to hearing from you, and if we can help serve you, please let us know how. Shawn: Hey, BioTrust family, I am back, Shawn Wells, with my partner, Tim Skwiat. And I wanted to go a different direction in this show. There’s something that’s kind of been on my heart lately. Full disclosure, I have had points in my life where I have been suicidal. And this is kind of a gray topic, not an upbeat topic. We’re usually an upbeat group. But it’s on my heart because it’s something I’ve dealt with and it’s on my heart because I feel like there’s other people out there that are hurting. And the thought about one person taking their life into their own hands and killing themselves, or maybe someone out there that could stop someone else from doing, is a powerful thought for me. A profound thought. And right now, there’s a lot going on. We’ve heard about some of our favorite musicians, Chris Cornell from Soundgarden, about a year and a half ago, killed himself; and Chester Bennington, the lead singer of Linkin Park, who had sold a bazillion records. He was super-popular. He had five kids, a beautiful wife, and all this stuff. He traveled the world, and killed himself. And so it’s not just this thing that happens to people that are out on the fringes. These goth kids that are lonely and just that have no friends. That’s not the case. And the discussion has been forced even more with some of these school shootings. Why are these happening? And bullying, cyberbullying, is a big topic. And 13 Reasons Why has been a massive topic, and now just heading into its second season. I saw the first one. I haven’t seen the second. But it’s a big discussion and I wanted to jump into this and get more serious. And building on that, we want to give you at least 13 reasons why not. I want to know what you guys think if we do broach some of these topics, that if we’re not always just talking about fitness and nutrition and supplements, and we can talk about mental health. Because I feel like the key, Tim, that we always have with all of our shows—and we’ve talked about this—is that mindset is kind of the thread that connects everything. All of our shows. And if you’re mentally hurting, maybe you don’t take your own life in your hands. Maybe you don’t go that far, but you have destructive behaviors. You have very counterproductive behaviors and people say why are they doing that to themselves? They know what it’s going to result in, dating this horrible person or eating this food that they shouldn’t be eating. You know, all these addictions. Always going out and partying and partying and partying. Spending a bunch of money that they don’t have. Like why are they doing these destructive behaviors, living like there’s no tomorrow? Why are they depressed or why talk suicidally? And I feel like we always talk about mindset and so mental health is important for your success. For your success with a diet, for your success in life, or your gratitude for you to have a proper supplement regimen, for you to have a long healthy life with anti-aging, or all the things that we’ve covered. I still feel like this is a relevant topic. Life is precious, and many of us need to be reminded of that — reminded of 13 reasons why not, so to speak. But of course, I want some feedback. But Tim, you have a unique perspective on this as well. I mean, I don’t know your own thoughts around this topic, but I’d love to hear them. But I know your wife is a therapist. And one of the first things I’ll say before we get into this is we are not therapists, we’re not medical doctors. I’m just someone who cares deeply. I’m an empathetic person. So, the roller coaster is a little greater for me. I have higher highs with my joy, I have lower lows. And when I feel lonely or I feel depressed, it’s very lonely, it’s very depressed. So, I have felt like taking my own life. And obviously I wouldn’t be here, I wouldn’t be on the show. I wouldn’t be “the World’s Greatest Formulator.” I wouldn’t be BioTrust and doing all this stuff if I had done that. And luckily I’ve had the right people around me. But some people don’t have the right people around them. Tim: Yes. To your point, Shawn, the big reason that you and I do what we do every day is because we’re driven to help people. I remember I decided to go to college to be an elementary school teacher because I just wanted to be able to influence at least one person’s life. And I think that’s something that we’re trying to do here, as well. If one person who listens to this show can get better in their life or get better at something that they’re really passionate about, that’s a big win for us. We get better every time we do this because it’s encouraging and inspiring to us. But if we can influence at least one person with this, it’s that’s a feather in our cap, for sure, and we appreciate the people listening for that opportunity. To your point, I have experienced similar things myself. I remember having a conversation with a mentor of mine. This was probably 12 years ago or so. And he asked me, “Where do you want to be in five years?” And I didn’t have an answer for him. Shawn: It’s all right, man. Tim: …and I was fortunate to meet my wife, who was in a similar place. And we actually brought each other out of it. Speaking of 13 reasons why not, she was a huge reason for me, and I was for her. It was pretty amazing. Just for the listeners, Shawn and I both, this is something that we hold close to our hearts because we’ve experienced it but also on the other end in the spectrum, this is something that we want to help other people get out of it or help them help others get out of it too. So, we feel very privileged to be in position where we can influence people in a positive way. And like you said, my wife is coaching people through these types of situations on a regular basis, and that’s a huge responsibility and opportunity at the same time. She’s there for others helping them discover their 13 reasons why not, so to speak. Tim: Yeah, absolutely. I learned a lot from her. And like I said, we brought each other out of very dark places. We didn’t know it at the time, really. But I guess my point of saying that is that you’ve got to find the right people to be around, to help show you your purpose — help illustrate those figurative 13 reasons why not — and help shine that light on you. And on the other side of the coin, if you’re not in that dark place and you are the light, shine that light on people. Don’t be afraid to shine your light on people. People need that. Be one of those 13 reasons why not for someone else. Shawn: There’s a scene—this sounds kind of nerdy, but I’m kind of a nerd—in Lord of the Rings, I think it was the first one, The Fellowship of the Ring, when I think Frodo falls off the boat and Samwise reaches out into the water and just plunges his hand into the water, and you think that Frodo’s gone. His hand goes deep into the water and just reaches in and grabs his hand and pulls him up out. And I’ve just had that image in my head when I think what you were talking about it. Do you have a bunch of anchors around you that are leading you to despair? That are sowing the seeds for negative thoughts? That are telling you that you’re not worthy, you’re not worthwhile, that are really abusive. Are you surrounding yourself with abusive people? We talked about, The Four Agreements, where they’re making you make agreements that aren’t true. They’re making you think that you’re ugly, that you’re fat, that you’re old, that you’re stupid, that you’re not good enough, that you don’t deserve this, whatever this is. You don’t deserve to have happiness. You don’t deserve to have joy, and they think that you should suffer. And not only should you suffer, but you should suffer alone. And we know that you don’t have to be alone to be lonely. Shawn: Maybe, like maybe was the case with Chester or Chris Cornell, or like we know a lot of comedians. You’d think they’d have way more than 13 reasons why not. They’re surrounded by these crowds and they feed off the energy of the crowd, but then they’re alone in their hotel room later that night, and it’s silent, and they’re on the road. And that energy contrast is intense and they feel lonely. And sometimes you can be in the biggest crowd imaginable and feel as lonely as you can possibly be. So, you don’t necessarily need to be alone to be lonely, but we know that the ultimate punishment is isolation. Shawn: Yeah, and if you think about prison. Prison is really bad, right? But what’s the only thing worse to you that they can do in prison? Isolate you, right? They put you in isolation. We know that you need that interaction, you need that touch, you need to have people talking to you, to feel like you are a person. And that’s part of the human experience. We are a product of all the people that we interact with. So, you need to know that you’re interacting with the right people. Are you surrounding yourself with people that are pulling you up out of that water when you’re drowning, or are you grabbing on to anchors? These people — the people you surround yourself with — they are one of those 13 reasons why not. Tim: You talked about that Harvard study before. That the most important factor in a long quality of life is relationships, right? These relationships are a huge source of those 13 reasons why not — literally and figuratively. And we see on the other side of the coin that social isolation literally kills people. Tim: So, the point there is if you are someone maybe who’s in that position where you feel isolated, it’s hard when you’re there to really dig your way out by yourself. But at the same time, you have to kind of seek those relationships and seek the people that help bring you up. Shawn: They probably also have fear sometimes about being inadequate, again, right? Shawn: They’ve been beaten up so many times about not being good enough. Maybe you encouraged them to go out and do something fun or whatever. “Hey, come out with me to Topgolf.” Now they’re thinking well maybe I’m horrible at golf and there’s going to be other people there and they’re just going to make fun of me because of my weight, because I’m not athletic enough, because I’m not funny enough. And then these things just become points of anxiety and it becomes a self-fulfilling prophecy when you actually go out there. You feel that anxiety. It’s palpable. And now you have a horrible time and you feel the eyes upon you and they see you as awkward. And then you go back home and you’re like, “Why did I even go do that?” And that can just feed into these feelings. Shawn: So now there’s a reluctance to go out and dig yourself out of that hole. So, to your point, that’s where you need to seek not only the right people around you, but certainly seek therapy. If some of this is resonating with you, you don’t have to have said, “You know what? I’m going to kill myself today.” You have to just be feeling depressed, I think, for this to resonate with you, or know someone who’s depressed. And you need to seek therapy. Not just the right people around you, but therapy, where therapy isn’t a bad thing. We all need therapy. But because you’ve put yourself in the situation for so long, and you have been abused and you believe you’re not good enough, then you’re looking at it through a lens that’s broken. A broken, cracked lens. And you need to go to a therapist to repair that lens — to help you see the real 13 reasons why not. They’re your optometrist, if you will. And the other thing, if you are in a very dark place and it’s imminent, you need to call for help immediately. There are suicide hotlines. There’s people out there that will help you immediately, and are qualified to do so. So, if you are listening to this and you feel that way, call that hotline. Now if you’re someone, again, that’s listening to this and maybe you think you have a kid, or a spouse, or a brother, or sister, or a friend that may be in a dark place and you’re not sure. You see them kind of pulling back, you see them doing destructive behaviors, then it’s time to have that discussion. It’s time to be one of those 13 reasons why not. And it’s maybe time to have that intervention. And it’s time to get the right people around this person, because you don’t want to let it pass. All these school shooters. If someone stepped in it, it could have been very different that day. I think there was a song by P.O.D. in the 90s that was something like that, where like if he only got love, if someone only said something beautiful to him that day, maybe he wouldn’t have done what he did. Because these people are hurting inside. Yes, it’s an awful thing, but here’s news to use. People aren’t, like we said, cartoons. People aren’t evil. You may think that. It may make it simple to just write people off as good or evil. We’re complex and we have feelings, and we’ve been abused in different ways. We feel inadequate in different ways. And sometimes our mind gets broken in that process, and then we can act out impulsively; especially if you have neurochemistry that relates to that. Some people are predisposed to these things, and they need the therapy even more. But we need to address it and we need to stop making this a shunned disease because we all deal with mental health issues. We all deal with depression. We all have our ups and downs. I challenge you, if you’ve never had a suicidal thought, then please write me and let me know who you are. You’re an amazing person because at some point or another, I think most people have dealt with pretty severe depression, and it’s a realistic thing. It’s a realistic thing to be a human and feel. And that in and of itself is one of these 13 reasons why not — this is normal. Tim: Right. And maybe one thing that you talked about early on was someone who’s kind of—I guess, toning it down just a little bit—someone who maybe is having trouble losing weight, for instance, and how does this apply. I find that in my experience as a coach, that mental and emotional-related issues are a major reason why people have a difficult time losing and maintaining weight loss. And to be honest with you, a lot of the reason why people are in the physical position that they are, in terms of being overweight or obese, or not fit, is because of underlying emotional or mental health issues. And a very visual example of that is if you ever watched the TV show, The Biggest Loser, it’s not just about move more and eat less. Tim: That makes sense from a mathematical standpoint. Burn more calories and eat less. But it doesn’t work that way. It’s not that simple. And there’s a lot of reasons why it’s not that simple, but one of them is because people have an emotional tie to food. Not everyone, but a lot of people do. It’s filling a gap for them, and it’s helped them get through very difficult situations. Shawn: Well, marketing is also exploiting those emotions. Tim: Shawn, what’s your goal? Shawn: I want to lose 40 pounds. Tim: Okay, Shawn, why do you want to lose 40 pounds? Shawn: Well I want to look better. Tim: Why do you want to look better, Shawn? Shawn: Because I want to feel better about myself. Tim: Well, why do you want to feel better about yourself? Shawn: Because I’ve always thought that I’m fat and overweight. Tim: Why have you always felt like you’re fat and overweight? Shawn: Well, that’s what I’ve always been told my whole life. Tim: And so, basically, asking a series of Whys, four to five times. At that point that was for Whys and really got to the deep-rooted part of it. You said it’s not that you want to lose weight, necessarily. It’s that you want to feel better about yourself and you want to quiet those voices. Tim: And 100%, when things get hard, a lot of times people are like, “I’m fat. This is what I’ve always done anyway, so I’m just going to eat myself to feel better.” Because in the acute setting, a lot of times that can help. People get through tough situations. But once you peel back the layers and understand why they may have gotten there, it’s extremely powerful; that emotional and mental health side of things. So, that’s one practical application that can be helpful, because some people don’t even know that about themselves until they start really asking those questions. Without being on the clinical side of things, maybe there’s other things that can help us balance our feelings and our mood, right? Like exercise is very powerful and underutilized. They talked about the power of social support and being around the right people. And this goes same if you’re trying to manage your weight and you’re around a bunch of people that are negative all the time and have Twinkies and Doritos and stuff around all the time. That’s not going to really help you. Shawn: For people that are naturally thin and are accusing using you for not being naturally thin. Shawn: But don’t empathize with your weight. Don’t put people around you that don’t empathize with you, don’t care about you, and don’t want what’s best for you. Take a look around right now. I want everybody to think about this, right now, just listening to this. Close your eyes, as long as you’re not driving. [laughs] Close your eyes and think about the people around you, the people you put around you, the people that are closest to you. Hopefully, the people you put around you aren’t just proximity. Hopefully, you’ve consciously chosen better than that. Hopefully, they’re aren’t just the people that are your neighbors and the people that just happen to be at work. Hopefully, you’ve chosen some people — people who give you those 13 reasons why not. You’ve gone out of your way to say that’s someone I want to be like, so I’m going to put them in my life. I really think this person is special. I think this person is intelligent. I think this person is kind and generous and all the traits that I want to be, so I’m going to put them in my life. And they will be a mentor, they’ll be a guide, they’ll be a beacon, a benchmark for me, and I’m going to have them in my life, intentionally. Hopefully, you have some of those people. Now, if you closed your eyes and all you came up with was proximity people and people that are negative and people that don’t care about your well-being, people that skip out on you when you try and make plans, people that say negative things about you behind your back. If that’s all you came up with one, when one, I’m sorry that that’s the case, but two, you need to take this into your own hands, take responsibility for it, and leave those people that are putting negative thoughts into your head and doing negative actions to you. You can give yourself 13 reasons why not by removing cancerous people from your life. And yes, that may be a painful process. They may even be family. But you need to take those people out of your life. If they’re just a source of negative, then you need to get those people out of your life. You need to seek out people that are positive, that are providing you growth, providing you support telling you positive things — providing you those literal and figurative 13 reasons why not. Challenging you? Yes, at times. But helping you become a better person. So you need to seek those people out at all costs. And if you have to change your job to do it and make less money, then do that. If you have to go back to school to find that, if you have to go to a Meet-Up to find that, if you have to stop dating the person you’re with or whatever, then do that. Certainly, I agree, talk to a therapist, but I’m saying there’s pretty much nothing more important than putting the right people around you, and you need to do it with intention. And I think a lot of this is what leads to those feelings of insecurity, those feelings of depression, or those feelings of inadequacy. Tim: Along those lines, if you be the mentor, also. If you’re in a position where you can be that positive mentor to someone else, be that mentor, reach—you said it was Frodo right? Tim: Reaching in. Be that Frodo and grab that person. Be the mentor. Be one of those 13 reasons why not. Tim: You and Ryan had talked about this recently, Make Positivity Louder, is the literally Ryan’s catchphrase. Tim: And he’s just this beacon of light, on so many lives because he’s embraced that. But we have the choice to be positive or negative with our mindset. And that’s not to say that don’t be genuine and that everything’s sunshine and rainbows all the time. It’s not. But always put things into perspective. Because clearly, things could be a lot worse for most people. There was a day recently that didn’t go according to plan. As a quick aside, our unmet expectations can often be a significant source of pain. Tim: And that’s probably a different conversation. But anyway, I was not feeling that great about this day because my expectations for the day weren’t met. And then all of a sudden the TV started beeping. My wife was watching TV and a child had been kidnapped, and it’s like things could be a lot worse. Proper perspective can help provide those 13 reasons why not. Shawn: Absolutely. I think we’ve talked about that before. That mindset would like the traffic and everything’s backed up and you’re like, “[sigh] Gosh, traffic.” But someone could be dead up there. You’re waiting 30 minutes because of backed up traffic, but someone could be dead up there, and that’s not you. Perspective is everything. And that’s where these mentors, you being the mentor and having the right mentors around you, can help you shift your perspective, can help you get out of your own head. Because that’s what I’ve found. When I’ve had these dark thoughts, I’m in my own head and I can’t get out of it. There’s thoughts that are just playing over and over and over, and it’s a record that just won’t stop. And I need someone to just come over and turn off that record player and just say, “Stop. Get out of your own head.” Like you said, “Come one. Let’s go out and do something. Stop that. Let’s go.” Sometimes that’s good enough. And that could have been enough — could have been those 13 reasons why not — for some other kids; people like Chris Cornell or Chester Bennington, or these school shooters. If someone talked to them that day, if someone said, “Hey, stop. Let’s go to the mall. Let’s go see a movie.” Not even had a deep conversation sometimes. As that presents itself, let it present itself. You don’t necessarily need to force it on someone, but just show them you care. And show them you want what’s best for them and like, “Hey, let’s go hang out.” And then I’m sure, at some point, they’ll just be like, “You know what? Dude, can I talk to you about something. Like I’m hurtin’ man.” If you let it present itself. But you have to be there for it to present itself. Tim: Right. Those events are rare. They isolate it. It’s not usually an acute response to something like, “Oh, that car cut me off. I’m going to go do something really bad.” It’s usually a cumulative thing that’s the result of cumulative buildup of negative events or feelings, or emotions. So, be present over time, and if you notice those behaviors or those patterns in yourself or in others, make sure that you reach out. Either way, reach out to that person or be that person that reaches out. Shawn: Well, Tim, this was empowering for me to vocalize. It’s something that I never really talk about. And I appreciate you vocalizing probably something that you rarely talk about. The reason to do that is so that people know that we’re not living some perfect lives and we understand and we deal with similar stuff. Again, I’ll go back to it doesn’t matter how good a life you think someone has. There’s people that are billionaires, there are people that are rock stars, there are people that are comedians, movie stars, and supermodels that have all killed themselves. It’s not the life you think it is. Shawn: It’s not the life that you wish you had. It’s all about perspective. It’s all about having the right people around you to keep you grounded, when you need to be grounded. But also build you up when you need to be built up. Shawn: So, I challenge people to start doing that. Start being the mentor, look for mentors, have intention with that. If you are needing help right now, then get a therapist immediately. If you’re in a really dark place at this very moment, I encourage you to call a hotline. If you need someone to help you discover 13 reasons why not, so to speak, reach out. On the other hand, if you know someone who’s hurting, be the one who gives them the 13 reasons why not. This has just been powerful. It’s been weighing on my heart, and I’m using this as a vehicle to just express my heart. And Tim has, as well, which I appreciate. So we’re going to wrap it up, but I would really like to know. I’d like to get the feedback from you, the listener, to know if this is something that you appreciate. That this is a direction that you appreciate. We try and offer you things that promote a better life for you, and I still feel like this fits in that in that mode. I think there’s a lot of people hurting out there. When you look around at social media, everyone looks perfect. We’re not all perfect. A lot of us are hurting. These people that are smiling and traveling, and taking these perfect pictures, and in bikinis, and whatever, and it looks like they’re just loving life. A lot of them are hurting. I just want to throw that out there that we care about you deeply, and hopefully you find value in this. Tim: Just one final thing to add, Shawn, is that online support communities can be an option for some people — they can be a tremendous source of those 13 reasons why not. We encourage you to have someone physically there, but online support communities can be extremely helpful. BioTrust does have an incredible community. Tim: Just go to BioTrust.com/VIP and you can join in over there. There’s thousands of members there. It’s many people who’ve struggled with various issues, including their weight, and as a community they’re helping each other. Shawn: Holding each other accountable. Tim: It’s just incredible what they’re doing there. Tim: Coach Cristina is leading that community and doing a fantastic job. So, that is an option that I think is relevant to mention here, as well. Shawn: Absolutely. All right, well thank you BioTrust Nation. I appreciate you guys sticking with us. And so far so good, I think, with our episodes. And Tim and I deeply appreciate you guys for sticking with us and telling us what you want to hear. This one was just really off-the-cuff. Again, it was just something that was on my heart and I think hopefully that makes for a good listening, because I’ve got to be true to myself. And like Tim said, if one person hears this in and it saves them, then that really makes my heart feel good. If we’re able to give just one person those 13 reasons reasons why not — literally or figuratively — that would be huge. So, we appreciate you and we’ll talk to you soon. Thanks everyone.